I have been suffering from anxiety recently and, unlike Asperger syndrome, anxiety does cause me a great deal of distress. I do call anxiety ‘suffering’. I don’t know the answers to anxiety (or even, much of the time, where my anxiety comes from), but I have a few techniques for reducing or distracting my mind from anxious thoughts. Fiddle-toys or stim toys are great at relieving stress, but some of the OT solutions look either childish or overly medical, so these are ‘grown-up’ looking alternatives. My favourite stim-toy is a string of worry-beads from Greece (also called ‘komboloi’), which are discrete and feel nice. I like heavy, glass beads on a smooth chain, but I keep losing mine and buy some every time I go to Greece. 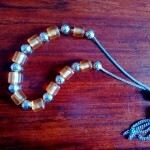 Rosary beads might do here, except worry beads have little religious significance. I keep mine in my pocket and most of the time nobody knows I am playing with them. It is better to fiddle in a jacket or coat pocket than in a trouser pocket, which might be misinterpreted! Any personal, familiar item in a pocket or bag, or an item of jewellery, is a comfortable object to feel grounded. It is like carrying a piece of home around with you. I also have a stress-ball made of heavy latex rubber, coated in synthetic fabric. It is looking tatty and I don’t know where to find a new one – this one had a logo on and came from a trade fair. 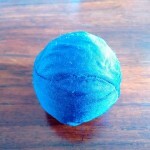 It is squishy and you could throw or juggle it, but mostly I squeeze it hard, which is probably good finger-strengthening exercise. 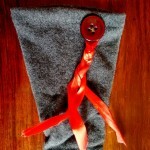 I heard about twiddle muffs last year and they are a fantastic idea, although I don’t use one. 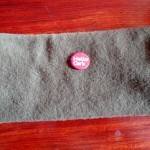 The basic design is a double tube of knitted or soft, durable fabric, sewn into a tube. A section of fabric 24″ by 12″ is first folded in half, then the edges joined for the tube. The idea was developed for people with dementia, to occupy hands and calm minds. This one is made from an old jumper with holes in the elbows, not knitted to purpose (a hot-wash will felt the wool, so it can be sewn more easily and is less likely to unravel). 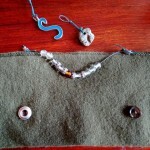 Some textured buttons on the inside are nice to play with and can hold loops to secure various items – a string of glass beads, my initial ‘S’ and a waxed beach pebble. This twiddle sleeve has a button that is nice to play with, but can hold some personal fiddle toy – ribbon to tug or braid, beads or pebbles. You could wear a twiddle sleeve underneath other clothing, especially if it was loose, and play with the fiddle toys inside your normal outdoor clothing. I often don’t know why I am anxious, and it it can hit quite hard and quite suddenly. Some of it is sensory – noise, movement, lighting, odours and physical discomfort all play a part. The physical discomfort can come from unpleasant skin contact (wet, cold and scratchy things especially) or from not recognising a full bladder or bowel – or just refusing to use unfamiliar and public toilets. I discovered expensive T-shirts (a bargain from TK-Max) make great underwear. Various blends of cotton, wool, lycra and viscose produce soft, stretchy fabrics that line any other clothing. They probably make boxer shorts and long-johns too, if you want to line all your clothes. 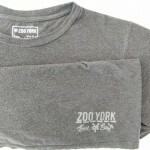 This T-shirt made by Zoo York is soft and has absolutely no scratchy labels – the branding and washing instructions are printed on in ink. There are lots of shirts and tops that have scratchy seams or are made from crinkly fabrics I hate wearing, and the T-shirt means that I can wear a greater range of clothes and (probably more importantly) choose clothes that suit social expectations rather than my mood. Otherwise I would wear the same thing until it wore out, because that over-washed, worn-in feel is the best clothing there is. If you know me at all, you will know that I usually wear a coat or jacket and this is also good tactile defense. If I keep my coat on, it isn’t because I am uncomfortable or on the verge of leaving, it is just the most comfortable way to be. Smell is probably one of the most emotionally-bound senses, so odours from foods, tobacco, perfumes and cleaning chemicals can have a big influence on calm. Probably more than the tactile senses, odour can be insidious and creep into mood without any conscious awareness. That means that your mood can be affected and you have no idea what has affected it, until you consciously detect the odour or someone else points it out. I like to burn incense sticks (impractical outside home) but I have disliked almost all spray ‘deodorants’ I have tried – there is no point overlaying one bad smell with another. 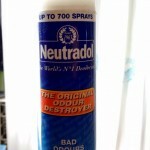 Neutradol is a pump-aerosol odour neutraliser that has a very mild smell – perhaps a little like banana just after spraying, but it dissipates quickly. It works very well on tobacco and other unwelcome smells. Baking soda works well in the fridge and on carpets (sprinkle it one, leave it a while and then vacuum). I love my noise-cancelling headphones. Like odour, there is no point overlaying one noxious sensory intrusion with another, so playing music on top of unwelcome noise will damage your hearing in addition to doing little for calm. Noise-cancelling headphones use microphones to pick up ambient noise, invert it and cancel out the noise you hear. They work reasonably well, but are deliberately designed (for safety) not to cut out all noise, especially human voice and alarm frequencies. Over-ear cups that enclose the whole ear work best, but have to press on the side of the head to isolate the ear well. Builders’ noise defenders (a fraction of the price, any hardware shop) work even better at isolation, but press harder. 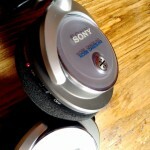 These Sony headphones were about €50 and are a relief from machine noise, jet engines, train carriages and so on. Bose headphones are more effective, but cost a few hundred euro. These headphones last about 20 hours on one AAA battery and do not need to be connected to a music source, although I usually play music inside my quiet bubble. In-ear phones (ear-buds) also isolate sound to varying degrees and provide an alternative, so you can switch between pressure on the side of your head and pressure in your ear. Some MP3 players include a noise-cancelling function. 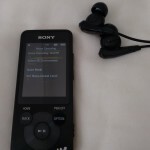 This Sony MP3 player has adjustable noise-cancellation and works well – it provides a quiet bubble mode as well, providing relief from noise without adding any music. It also has FM radio. Ear-buds have a big advantage of not being so visible, especially if you are self-conscious about wearing bulky earphones in the street. Airplane cabin crew are also less likely to notice them and tell you to take off your noise isolation during take-off and landing – the noisiest part of any flight, and the time when you most need noise relief. I also wear woolly hats, which cut out some noise and particularly cut out the squealy high-frequency noises that are most annoying. At my age I can get away with wearing a hat most of the year (especially in Ireland, where it rains a lot anyway). I criticise drug over-prescription and psychiatry a lot, but anxiety medication is very effective. Anxiety medication is by prescription only and might be prescribed by a GP, but should be assessed by a psychiatist if you have a mental health issue or use more than one psychotropic drug (in which case you probably see a psychiatrist anyway). I use a precription for generalised anxiety disorder, which I take every day. 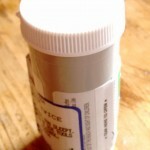 I also have a PRN prescription for an anxiety medication that I can take when I feel particularly anxious or panicked. It works best if the anxiety is predictable and I take the medication before the anxious event – such as going to a meeting, walking through security or going somewhere new. As it says on the labels, anxiety medication often affects concentration and alertness, so driving (I don’t, but I walk in a city full of cars) and operating machinery (I use power tools) can be dangerous when using medication. Sometimes I have intrusive thoughts, images of violent and unpleasant outcomes of things like powertools. My current one is a wood chisel, and I have not used a chisel for five months because of it. I use antipsychotic medication (antipsychotics are better termed ‘major tranquilisers’, because that is what they do) to reduce these thoughts. The medication is not in the least specific or targeted and it hits all mental functioning, so as well as reducing the distressing imagery and anxiety, it also blunts all emotion and slows thinking to a complete crawl. I feel like my skull has been packed with cotton wool and when I turn my head the world takes ages to catch up with my head movement, like a snow-globe full of syrup. It is a relief (like the silent bubble in the noise-cancelling headphones), but with a big negative effect too. I don’t know what taking illegal drugs is like, but I do know that I can get the most incredible high from focusing into music or an interest. Spending time inside a track like “Drone Logic” by Daniel Avery (https://www.youtube.com/watch?v=eS0CO-yPmO4) is a great relief from stress. With work, I find that I can get into the zone of writing software, statistical analysis or data manipulation and suddenly hours have passed without any awareness of the distress of anxiety or any real-life worries. I don’t think I have ever met an autistic person who does not experience elevated anxiety, by which I mean anxiety that impacts their life and function more than most people. Anxiety comes out in all kinds of ways, from the most eloquent writing about the causes of personal distress, through social avoidance, self-harm and mental health therapy into increased levels of repetive behaviours and unverbalised aggression. Anxiety that is untreated leads on to more serious mental health issues including chronic stress, depression and suicidal thoughts or actions. Beardon and Edwards reported that 68% of adults with Asperger syndrome had contact with mental health services for anxiety, depression, suicidality and related issues. Most experienced these before their diagnosis with Asperger syndrome. The report is worth reading for the personal experiences in the textual responses to the questions. Happé and Charlton reported that 50% of adults with ASD experience clinically significant anxiety. It is not clear whether anxiety is a core feature of being autistic, or if the problem of anxiety is a consequence of other impairments – for instance planning, executive function and emotional processing. Anxiety is a normal part of conscious awareness and an important experience – we wouldn’t run from danger or be careful without it. No roller-coaster ride or extreme sport would be fun without anxiety. The ‘problem’ of anxiety is when it become clinically significant and impacts on life. Luke et al write “Our findings suggest that, compared with neurotypical individuals, intellectually able people with ASCs experience greater difficulty with decision-making. Decision-making in ASCs was associated with anxiety, exhaustion, problems engaging in the process, and a tendency to avoid decision-making.” Anxiety has a huge impact on functioning and prevent participation and activity.